Our CytoWorks 200 system provides researchers with all of the tools necessary to perform live-cell time-lapse imaging in an affordable package. CytoWorks 200 combines a compact stage top incubator, an easy to use software package, and both fluorescent and visible imaging systems. In addition, fluidics ports on the front of the incubator allow you to feed and treat your cells without having to remove the plate from the system. The CytoWorks 200 system is fully customizable and reliable, and provides you with the tools you need to conduct your research more quickly and effectively. 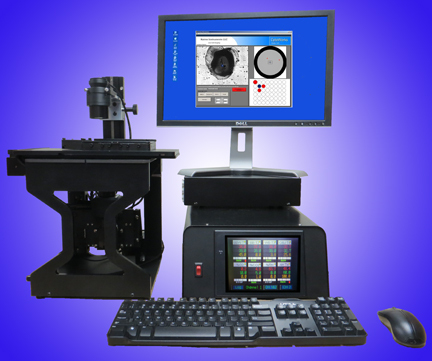 The CytoWorks 500 system provides researchers with a powerful and complete imaging system. The base of our CytoWorks 500 imaging system is a Nikon-Ti-U inverted microscope. 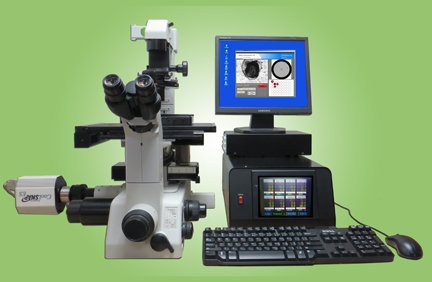 We attach a custom incubator and table to the microscope to control environment and position. Then we add a camera and fluorescent imaging (Quad Filter, FITC, and Texas Red cubes are available) to the system and complete complete the package with our easy to use data collection software. As with all Kairos products, each CytoWorks 500 system is fully customizable and reliable, and provides you with the tools you need to conduct your research more quickly and effectively.